Maintaining an aquarium takes knowledge and a great deal of patience. Unfortunately disease can occur at any time and without your knowledge. Fish should always be quarantined in a seperate aquarium before being introduced to the display tank. However, sometimes this just isn’t possible. When making your decision to start an aquarium, you shouldanticipate the possibility of fish diseases such as ich. Ich is very commonly encountered in the aquarium hobby. Thus, it’s important to know the best ways of both preventing and curing Ich. In this article we will give a brief overview of the disease followed by the best ways to cure it. 1. It is never recommended to medicate your display tank. 3. Remove carbon and other chemical absorbers from the filter. What are some recommended commercial products for Curing Ich? Ich (also known as ick) is a very common disease affecting tropical fish. Both Freshwater and Marine species are susceptible to the disease however it is not known to affect invertebrates. Ich is one of, if not the most common disease. It is also responsible for the majority of disease related deaths in the aquarium. Ich can be identified by its distinctive white dot appearance. Ich can be identified by looking for a number of symptoms. Fish will have white, round dots attached to their gills and/or body. These white dots are usually between 0.5 to 1.5mm in size. Affected fish may try to scratch themselves on rocks and hardscape in the aquarium. Scratching and itching is one of the early warning signs of ich. Fish may also seem lethargic, have rapid breathing and generally seem unwell. If you have any concerns about any of the fish in your aquarium it is always better to quarantine that fish. Place it in a seperate aquarium and lower the risk your entire colony becoming affected. At later stages of the disease the fish may lose its appetite completely. At this point the disease becomes fatal to the majority of carriers. Be sure to remove dead specimens as quickly as possible. This will prevent spikes in ammonia and nitrite. Most aquariums already host some form of protozoan which can affect its inhabitants. The easiest way to describe Ich is to compare it to the common cold in humans. When tired, stressed and run down you are much more susceptible to becoming sick. This due to your immune system weakening. The same happens for fish. Fish that have recently been moved to a new aquarium can become easily stressed. Their weakened immune system makes them highly susceptible to disease. This is when Ich is most prevalent. Strong, healthy and acclimatised fish are much less likely to fall victim to the disease. For this reason reducing stress on your new inhabitants is crucial. Ich is much easier to prevent than cure. Prevention is step one below and we will go into further detail. Prevention of Ich is the most effective route in making sure Ich never exposes itself in your aquarium. Taking steps to avoid the disease will greatly reduce the need for curing ich. Using a quarantine tank. The importance of a quarantine tank cannot be stressed enough. Store bought fish often carry disease. Even very healthy looking specimens can introduce parasites and protozoans. Keeping fish quarantined for two weeks will ensure disease is rarely spread to your display tank. Quarantine all plants. Plants should be quarantined for at least 3-4 days. Plants, like fish, can also introduce disease into your aquarium. Minimising transport of your new fish will help to reduce its stress. Stress is the number one precursor to ich. 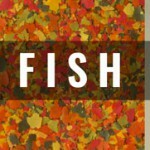 Matching aquarium parameters to the store parameters when adding new fish. Never purchase fish that have been in a tank with other diseased or dead fish. Be aware many stores use the same water for a number of display tanks. If the fish generally look unwell, show signs of itching or are breathing rapidly do not purchase fish from this store. Don’t overstock. Overstocking a tank is one of the more common reasons for ich outbreak. Make sure your inhabitants have plenty of room to grow. Regular water changes. By keeping nitrates low (and ammonia and nitrates at 0) it will reduce stress on your fish. This will make the likelihood of disease much, much lower. 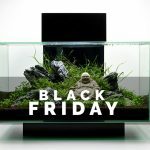 Purchase Plants from tanks without fish. Ich cannot survive without a host fish to carry the disease. Aquariums void of fish are much less likely to have ich. Always purchase plants from plant only display tanks. If you can manage to follow at least a few of these simple steps, the possibility of Ich becomes extremely low. Preventing Ich is much easier in than inevitably curing ich. Always take caution when purchasing any live products from a fish store or online. If in doubt, don’t rush the purchase. Ich has a short life cycle that can be shortened even further by increasing the temperature. The ich protozoan metabolism speeds up in tandem with the tanks temperature. There are a number of advantages and disadvantages of this method we will discuss below. It is recommended to increase the temperature to at least 86 degrees (30 celcius) from its current state. It is not recommended to exceed 90 degrees (32 degrees celcius). Most tropical fish will be able to withstand temperatures around 86 degrees for shorter periods of time. Ensure your species are able to cope with temperatures this high before proceeding. It is recommended to increase the temperature by no more than 2 degrees every twelve hours. When your desired temperature is reached it should be left at this level for at least 2 weeks. After this time period, slowly reduce the temperature back down to its normal state. There is a fine balance between shortening the life of Ich and placing your fish under undue stress. Unfortunately some strains of Ich will not be affected by temperatures of 86 degrees. In this case, 88 degrees or 90 degrees may be necessary. If you have a quarantine tank, it is an excellent time to transfer your tanks inhabitants. You will then be able to push the display tank temperature much higher (96 degrees+) and leave the tank for 48 hours. Without any inhabitants, the high temperature will quickly kill the ich. In the quarantine tank, increase the temperature to at least 86. Slowly add the inhabitants back to the display tank after a few week. Only do this when you are certain none of them are carrying or showing signs of the disease. This solution is the most optimal, however not always possible. Increasing the temperature will reduce the life cycle of Ich. It will make it far easier to remove from the aquarium. Although higher temperatures speed up the life cycle, you may not completely kill Ich. The only guaranteed method to remove it from the aquarium is to remove the fish completely and push the temperature above 96 degrees for at least two days. 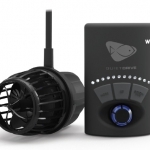 It requires constant monitoring of your aquarium and fish. For some fishkeepers this may no be possible. Raising the temperature of your aquarium can definitely aid in curing Ich. However, it should only be one point of attack. Raising the temperature alone can sometimes fail to completely remove Ich from your aquarium. Fish should be kept in quarantine for some time until you are certain the Ich has been removed. If absolutely necessary, use medications in the quarantine tank. It is also highly recommended to read through the prevention step above. Ensure to be vigilant when purchasing live goods from a store. Unfortunately, sometimes medications are the only option. When using medications for curing ich there are three key points to remember. Always transfer your fish to a quarantine tank before medicating. The chemicals from the medication will never completely be removed from the aquarium water column. For this reason it is essential to use a quarantine tank. Some medications can be dangerous to plants and anaerobic bacteria. Some medications contain copper which can be lethal to invertebrates. Ensure to read up online before using some medications. Read the directions and use a calculator to work out the dosage required. Never add more to the aquarium than recommended. If the dosage is daily, it is usually a good idea to spread the dosage over a number of hours. This will allow you to see if any negative reactions occur in lower concentrations. Carbon and other filter media will absorb the chemicals in the medications. Rendering them useless. Be sure to remove all forms of chemical filtration before adding the medicines. There are a number of proven products that may help you beat Ich. These are Fenbendazole, Garlic Guard, Kordon Rid Ich, Para Guard and Melafix. Each tank has different inhabitants who react differently. Garlic Guard is essential for fish that are having trouble consuming their food or are not hungry. The smell of garlic is a natural diet enhancer and should help you to keep them eating through the worst of the disease. Reducing the stress of your fish is imminent to your future success. Kordon Rid Ich is one of the more popuplar ‘Ich Exclusive’ medications. It is described as having “two powerful medications” which are most likely some base form of Fomalin. This means the medication is powerful and deadly. Use any Ich medication with extreme caution with your inhabitants. The medications are toxic enough to kill the parasite while sparing your fish. This is a fine line to dance. Melafix/Pimafix are likely to have a similar make up of chemicals, although it is very difficult to know. There is no requirement for these companies to digress what ingredients they use. I would always recommend using an established brand for this reason. ParaGuard is an aldehyde, which is probably preferable to other medications as it is undoubtably less toxic. On the downside, ParaGuard is not made exclusively for curing Ich. Medications that have a range of purposes will always make me more skeptical than those made specifically for Ich. Here’s what Seachem says about its product: “ParaGuard contains no formaldehyde or methanol and will not alter pH. ParaGuard employs a proprietary, synergistic blend of aldehydes, malachite green, and fish protective polymers that effectively and efficiently eradicates many ectoparasites on fish (e.g. ich)”. I think it’s useful to know Ich’s life stages more exactly simply because Ich is only vulnerable to medications while it’s in its free-swimming life stages, which are very short. The better you know the enemy, the better your chances to defeat it, especially if you get one of the more resistant strains. 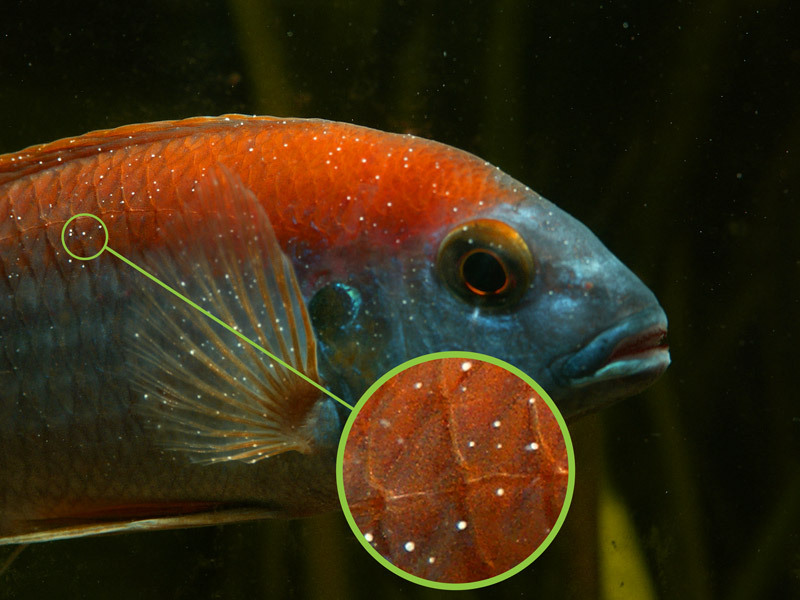 What we see as white spots which are visible on our fish is a life stage known as a trophont. The trophont feeds on the fish’s body fluids, weakening the fish. The more Ich the fish carries, the weaker it becomes. Trophonts are entirely immune to medications because of the protection they’re afforded from the fish’s own slime coat. Once the trophont stage matures it drops off the fish’s body and for a very short time, possibly just a few hours, it will freely swim in the water column and become vulnerable to medication. it will quickly settle to the bottom or onto a plant and encyst, forming the third, or reproductive life stage, called a thermont. Thermonts hatch fairly quickly, depending on the exact temperature, into hundreds of free swimming tomonts which are again vulnerable to medications, but only until they find a fish host to attach to. These tomonts haven’t very long to find a host and if they fail to do so in time they will die. This is why removing all fish from a display tank for a couple of weeks will clear the display tank of Ich. But those fish still have to be treated, one way or another, while they’re not in the display tank. And please, be aware that if the display tank is planted you MUST NOT use salt. Salt will kill your plants! The time during which Ich are immune to medications and salt is quite a bit longer than the short time during which they are vulnerable, so persistence with treatment is important. It’s best to continue the chosen treatment until at least 4 or 5 days have passed since you last observed any white spots on the fish. This is because Ich can hide inside the mouth or gills where they are impossible for us to see. The extra days of treatment done after the body and fins appear to be clear are the very best insurance that you will kill ALL the Ich during the treatment time. If even one trophont survives, you will find you have Ich showing up on the fish gain in a few weeks. Better to treat a few days longer and be sure than quit too soon and have it all to do again. Brilliant comment, thank you for taking the time to write this! I am sure other readers will be able to gain some valuable insight as did I. If you have “lost” fish how long should you wait to replace them? 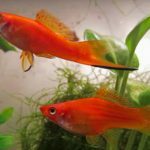 What should you do to prepare your tank for them? I heard that Marine Ick isn’t affected by raising the temp? Is it true? is it possible to introduce new fish into a tank that is currently being treated for ick? also is it possible to constantly cure a tank by feeding your fish garlic, and or have cleaner shrimp. and what could really reduce the multiplication of ick? 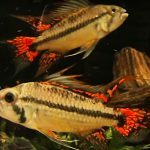 We have mated pair blue rams, 2 gold rams, 3 male dwarf guarami, male/female rainbowfish, 10 bloodfin tetras, 6 serpea tetras and plecos/corydoras in the treated 55 gal tank and all the fish tolerated just fine. Thank you so much for this detailed post. I’m dealing with my first outbreak of Ich. I was out of town and came home to it. I’m overwhelmed and devastated. Lost several fish already. Your post gives me some hope. Thank you. I have used garlic cloves they healed the ick up for me.I was going though the same thing you were and I did the garlic and it is better.Good luck. I was wondering how to clean my aquarium sand from ich. I also have 5 live plants, and a lava rock. Could someone please tell me how I can clean this stuff? The point that “Melafix/Pimafix are likely to have a similar make up of chemicals, although it is very difficult to know. Neither of these “medications” have Malachite Green or Formalin, or else it would be on the label. These two products are sold as “natural” and use some sort of tea tree bark, and it is stated on the label. A great update for this article is knowing that Rid Ich states it has Malachite Green AND Formalin. I am no government employee, but I believe both active ingredients need to be identified commercially. Also, I believe if either the Melafix/Pimifix had Malachite green in it, which is what is in Rid Ich (along with the formalin) you would know it. It would make your aquarium a blue/green. Should I perform water changes while treating ich with only heat? I realize this is an older post I’m commenting, but I’m casting about wherever I can for advice. I have a 55-gallon display tank that I’ve had for over twenty years, so it is well-cycled. (I replaced the filter last year with a new two-barreled biowheel filter, but I’ve verified there’s no trace of ammonium or nitrite in the tank, so that too is now well-cycled.) I normally keep the temperature at around 79F. My water parameters are around 10 to 20 ppm nitrate, 0.5 ppm phosphate, carbonate hardness 5 dH, general hardness 6 dH, pH out of the tap somewhere around 7.4 but I CO2 inject to bring it down to 7.0. The tank is planted with several dwarf cryptocorynes that are doing great, some dwarf anubias that is also doing well, several swords that are not doing quite as well, some ludwigia and bacopa that are struggling to get established, and some water wisteria that is not doing well at all. Animal inhabitants are an uncensused but fairly large population of Malaysian trumpet snails, two of what my local store calls zebra mystery snails, a very young Ancistrus cat, eight otocinclus, three Siamese flying foxes, two clown loaches, two Bolivian rams, and seven rainbowfish (two male Boesmani, three female Boesmani, and two turquoise.) Many of these are new stock I added two Fridays ago as a holiday spending binge — the ancistrus, some of the otocinclus, the two turquoise rainbowfish, the rams, and the Siamese flying foxes. I also purchased a 5.5 gallon tank on sale with thoughts of using it as a quarantine tank, but as it hasn’t cycled yet, I put just a single dwarf gourami and snail in it intended to closely monitor until it cycled, and put the other new ones directly in the display tank with as little of their old water as possible.